SEAT’s big little thing at the Goodwood Festival of Speed will be the new SEAT Ibiza, which will be available for test drives at the Moving Motor Show. That said, with not much changed visually on the facelifted car, test drivers will be well served spending their time fiddling with the stereo – where most of the update work has gone. With the car already one of the very most attractive small hatchbacks on sale, SEAT focused on making the touchscreen infotainment experience a far more Leon-like experience – the Leon’s system comfortably one of the slickest, most intuitive on the market. In fairness, the car does now come with a new engine range, ranging from a three-cylinder TSI petrol unit with 75PS to a new 1.4-litre four-cylinder TSI unit with exactly twice that amount. The cleanest version is now a three-cylinder TDI diesel that manages 83.1mpg combined and 88g/km. 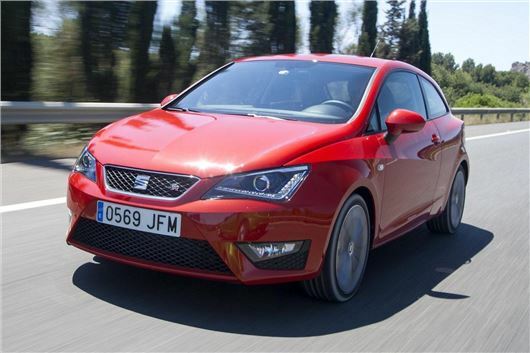 SEAT has fettled the suspension too, in order to make the car more comfortable – a traditional SEAT weakness – and has additionally introduced an optional Driver Profile pack that offers adaptive damping. SEAT will also show a Leon Cupra 280 model on the Hill, with a Sub8 Performance Pack-equipped car doing the climb in the ‘First Glance’ category. The Spanish company’s static display comprises the Mii by MANGO, Leon X-Perience and Leon Cup Racer. Click here to read why the SEAT Ibiza ST was recently crowned our highest rated car at the 2015 Honest John Awards.